According to Jacobus de Voragine´s Golden Legend (c.1260), 14 years after Christ´s Passion, Mary Magdalene and her companions were abandoned and set adrift in a small boat to die. The boat miraculously landed on the shores of the Gulf of Marseilles, where the rest of the saint´s life ran its course. This place, in which she chose to devote herself to the contemplation of divine matters, was barren and lacked water and sources of food. Consequently, every day at the seven moments corresponding to the canonical hours, the angels would carry her to Heaven so she could attend the Divine Office ... with her own bodily ears, she heard the canticles intoned by the glorious celestial armies. This spiritual nourishment compensated for her lack of food and water in the desert. José Antolínez, a painter from Madrid, turned to this subject to compose one of his most successful works, in which there is remarkable unity between his faithfulness to the story and its realisation on the canvas. This portrayal of the Magdalene reflects an unmistakable typology, and the event depicted is specific to her story. Visually rich with information, contemporary viewers would have recognised the scene depicted here with ease, identifying objects and actions that point to different aspects of the tale. The coastal landscape is one of the most evocative fragments of natural scenery from this period of Spanish painting and alludes to the Gulf of Marseilles as well as the desolate surroundings in which the last three decades of the saint´s life took place. The books make clear that she devoted her time to the contemplative life, while the scourge held aloft by one cherub and the portion of hairshirt visible around the Magdalene´s abdomen reveal that she combined penitence with meditation. Above, two cherubs hold a bottle of perfume -the saint´s traditional attribute- which recalls her anointing the feet of Christ. Finally, the angel that emerges from the heavens playing a lute alludes to her daily source of spiritual sustenance. This figure is prodigious: accompanied by rays of divine light, it is noteworthy for the way in which Antolínez´s confident technique enables him to convey a sense of lightness of material. The woman´s beauty, the intense expression of rapture on her face and the artist´s generous representation of her hair and body are combined with loose -though self-assured- brushwork and an extraordinary range of blue and violet hues, producing one of the loveliest depictions of the saint in seventeenth-century painting. 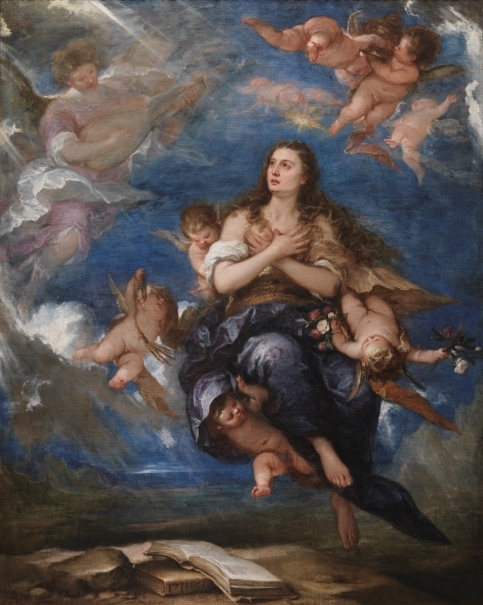 The work has been described as an homage to Titian, for the Venetian painter´s use of colour provided the point of departure from which Antolínez´s work evolved towards great dynamism and lyricism. Given the stylistic maturity of this painting, it probably dates from around 1670-75, during the last years of this artist´s brief career. Mary Magdalene was one of the most beloved of saints in the Spanish Baroque, a predilection that is evident in the voluminous number of high-calibre artistic and literary works produced in this period. In the varied iconography of the Magdalene, emphasis was typically placed on her life of asceticism, for it embodied the Counter Reformation doctrines regarding sin and penitence and exemplified the possibility of finding forgiveness for sin. Additionally, her story provided artists with one of the few opportunities to portray a woman of great beauty revealing parts of her body -breast, feet, legs- that in other contexts would have been considered indecent to show. The appeal of the Magdalene lay in the extreme concepts that she embodied, concepts as disparate as repentance, sin, penitence, beauty, decorum, the flesh, mortification and ecstasy. 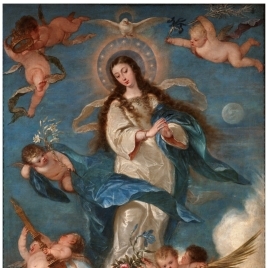 This painting was purchased in 1829 by Ferdinand VII with the aim of strengthening the presence of the Spanish Baroque school in the Museo del Prado Collection, which had been established ten years earlier. Height: 205 cm. ; Width: 163 cm. Mayer, August L., La pintura española, Labor, 1949, pp. 494. Angulo Iñiguez, D, José Antolínez.Obras inéditas o poco conocidas.Separata ., C.S.I.C. Instituto Diego Velázquez, Madrid, 1954. Angulo Iñiguez, Diego, José Antolínez, C.S.I.C.Instituto Diego Velázquez, Madrid, 1957, pp. 27/lám. 30. Kubler, George, Art and Architecture in Spain and Portugal and their america..., Penguin Books, 1959, pp. 288. Ars hispaniae: historia universal del arte hispánico, Plus Ultra, 1971, pp. 286. Prinz Von Hohenzollern, J.G., Von Greco Bis Goya. Vier Jahrhunderte Spanische Malerei, Haus Der Kunst, Munich, 1982. Museo Nacional del Prado, Museo del Prado: catálogo de las pinturas, Museo del Prado, Madrid, 1985, pp. 18. Sullivan, Edward J., Baroque painting in Madrid: the contribution of Claudio Coello, University of Missouri Press, Columbia, 1986, pp. 24/lám. 26. Carreño, Rizi, Herrera y la pintura madrileña de su tiempo :, Ministerio de Cultura: Banco Herrero, Madrid, 1986, pp. 282. Sullivan, Edward J., Claudio Coello y la pintura barroca madrileña, Nerea, Madrid, 1989, pp. 501/lám. 26. Museo Nacional del Prado, Museo del Prado: inventario general de pinturas, I, Museo del Prado, Espasa Calpe, Madrid, 1990, pp. nº543. Ayala Mallory, Nina, Del Greco a Murillo: la pintura española del Siglo de Oro, 1, Alianza, Madrid, 1991, pp. 239 lám. 214. Urrea, Jesús, La Pittura Madrilena del Secolo XVII, Edizioni Carte Segrete, Roma, 1991, pp. 148. Buendía, José Rogelio, El Prado. Colecciones de Pintura, Lunwerg Editores, Barcelona, 1994, pp. 133. Museo Nacional del Prado, Velázquez, Rubens, Lorrain: Malerei am Hof Philipps IV, Kunst-und Ausstellungshalle der Bundesrepublik Deu, Bonn, 1999, pp. 236. Museo Nacional del Prado, Pintura barroca española: guía, Museo Nacional del PradoAldeasa, Madrid, 2001, pp. 242. Portús, Javier, La colección de pintura española en el Museo del Prado, Edilupa, Madrid, 2003, pp. 154. De Tiziano a Goya. Grandes maestros del Museo del Prado, Museo Nacional del Prado- SEACEX, Madrid, 2007, pp. 227. Portrait of Spain. Masterpieces from The Prado, Queensland Art Gallery, 2012, pp. 144-145, nº33. Hoffman-Samland, Jens, 'José Antolínez. Ángel con los brazos cruzados sobre el pecho'. En:, Dibujos españoles en la Kunsthalle de Hamburgo, Museo Nacional del Prado Meadows Museum, Southern Methodist Univ. Hamburger Kunsthalle, Madrid, 2014, pp. 134. Inv. Real Museo, 1857. Núm. 543. Antolinez (don Jose) / 543. 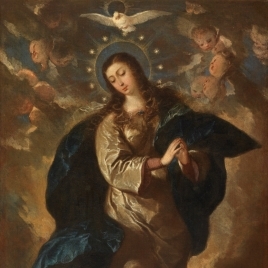 La Magdalena. / Está en éxtasis, sostenida por unos an- / geles y rodeada de otros. / Alto 7 pies, 4 pulg; ancho 5 pies, 10 pulg. Catálogo Museo del Prado, 1872-1907. Núm. 629. Catálogo Museo del Prado, 1910. Núm. 591. Catálogo Museo del Prado, 1942-1996. Núm. 591. Instruments, String / Chordophones: Un ángel tañe un laúd poco definido visualmente. Tiene las características propias de estos instrumentos: caja con fondo abombado, contorno periforme, rosa central en la tapa armónica y clavijero en ángulo recto respecto al mástil. No se ha definido el número de cuerdas ni clavijas. El ángel está en actitud de tañer el instrumento. El instrumento evolucionó a partir de su ancestro directo, el "ud", original de Medio Oriente que aparece en Occidente en los siglos IX y X. Floreció en toda Europa desde el medioevo al siglo XVIII (Proyecto Iconografía Musical, U.C.M.). A mediados del siglo XVII el laúd era uno de los instrumentos más apreciados en Europa para el acompañamiento de las capillas religiosas y como instrumento solista. El laúd suele simbolizar la armonía y la perfecta afinación.